It feels like I haven't talked to you all in a long time. According to my last post it's only been about a week but dang. Maybe it's all the stuff I've been doing at work and getting ready for the cruise. I had to get suits from 3 places and ended up buying 2. I bought 4 off amazon but they all have to be returned because they don't fit. I did buy a pretty new Victorian corset cocktail dress and a pirate shirt for pirate night though. Come to find out DH didn't get the time off so there is a chance we will have to cancel the cruise. He can't call in because he used the discount for it and he can be terminated. He says he's not worried and that he'll be able to trade it but I'm slightly freaking. We're supposed to leave in 3 days. I think we're going to have to start bribing people. DMIL comes in 2 days but we won't see her until the day before we sail since she's flying straight to Miami which is a 3 hour drive. We both have work so we can't leave here until around 7:30 the night before. I haven't packed anything yet but I have Wednesday off so I can pack then. Stitching wise I've been a little preoccupied with my trip so I haven't made as much progress as I would like but I have managed about a quarter of a page. Since there are letters in the way the rest of the half shouldn't take long. I want to finish the page on the cruise. We just bought a new printer that we found a great deal on so I'll be able to print out a page or two so I'm not lugging my kindle all over giving someone a chance to steal it. Not that I'm expecting that but you never know. Plus it's hard reading a pattern on it because even zoomed in it's too small and goes to the screensaver too quickly. Well that's all the updates for now thanks for listening. By the way if anyone's looking for a good book recommendation im rereading the 500 Kingdoms series by Mercedes Lackey. They're a new twist in fairy tales. Oh dear I so hope he gets the time off so you two can enjoy your cruise. Lovely job on the stitching in the meantime. I used to read Mercedes Lackey... quite awhile ago actually... and I always LOVED her books. May have to pick up another one now. I disabled the screen time out on my tablet and DH was able to fix the zoom issue. If you are using EZPDF, there is a setting you can change to let you zoom in more. Oh no, I hope it all works out for you!!! Great stitching, this is a great design. Oh I hope it gets figured out quickly. I would be in panic mode too. Love your piece! The colors are just gorgeous. Still think it says something about Smelly Feet haha. Wonderful progress Heather. Hope hubby can get the time off from work. I hope you all get that much needed vacation. 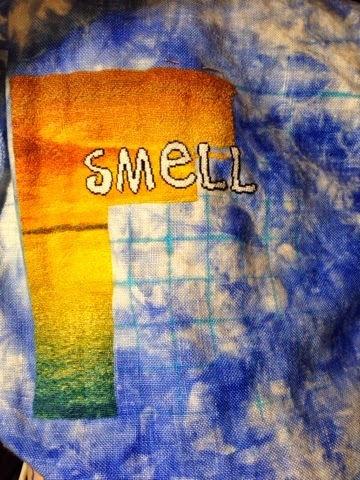 Ooh, smell is already spelled out! What could the next word be? You're getting us excited. Hope all works out for the cruise!